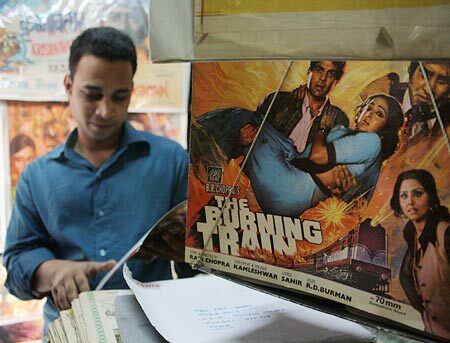 Sonil Dedhia visited the bylanes of Mumbai's Chor Bazaar with photographer Hitesh Harisinghani and stumbled upon a tiny shop selling rare posters of Hindi movies. On a busy Friday afternoon, Chor Bazaar -- situated in South Mumbai -- is lively and bustling with people, bursting with sounds and vibrant colours. Right from a microwave oven to I-Phones to imported pens and gadgets, everything is for sale on the streets here. 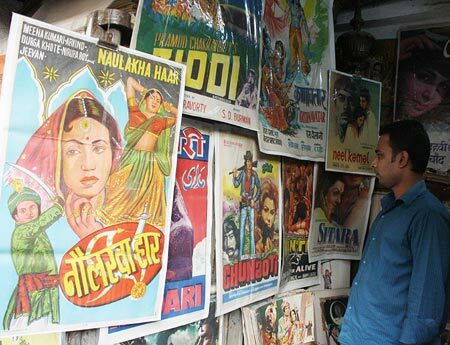 In a tiny and bustling lane that leads away from Chor Bazaar's Mutton Street stands Haji Abu's Poster Stuff, which exclusively sells Bollywood posters and other Hindi film memorabilia. Abu's passion was passed on to him by his father. He started the business eight years ago when he realised he could turn his hobby into his bread and butter. As I enter his shop, I remember Naseeruddin Shah's famous dialogue in Hero Hiralal -- 'Phata poster nikla hero'. My grandfather started collecting posters back in 1940. He loved watching movies and his legacy was passed on to my father and then to me," says Abu. He had lots of posters and nowhere to store them so I thought why not sell them." The posters are priced at upwards of Rs 500. The most expensive one fetched him Rs 4 lakh. "It was of a 1928 silent film Kalyan Khajina. It's the most expensive poster I have sold to date." 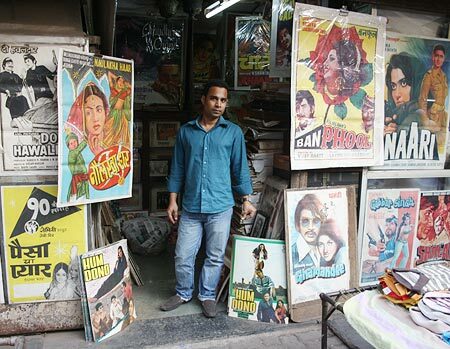 Abu sources his posters and other film memorabilia from cinema halls, production houses and also private collectors. He has a collection of more than three lakh posters which he sells in India and abroad. "People who are interested in collecting posters come from as far away as UK, Canada, USA and other places . People are also interested in buying special brochures and movie tickets," he says. The posters are stored in hardboard tubes. Abu recalls that the first poster he bought -- it was of Amitabh Bachchan's Don -- cost him Rs 300. "I got it very cheap. Even today, Bachchan's film posters sell like hot cakes," he says. 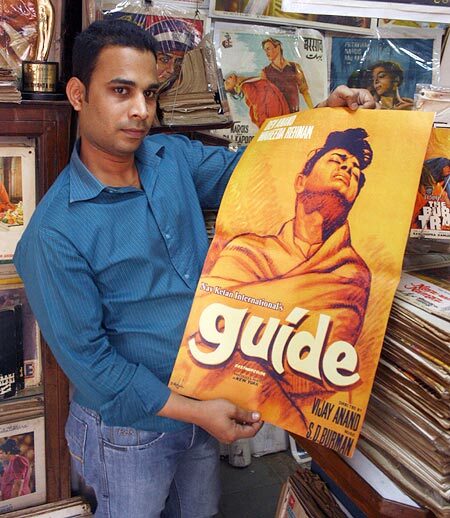 Today, the most expensive poster in the shop is of Dev Anand's Guide. "I cannot reveal the exact price, but it costs more than Rs 1 lakh. The film was a huge hit and the poster was printed in a New York printing press. Dev Anand got all the posters himself from the press," explains Abu. His favourites? "I love Guru Dutt. All his movies were black and white. 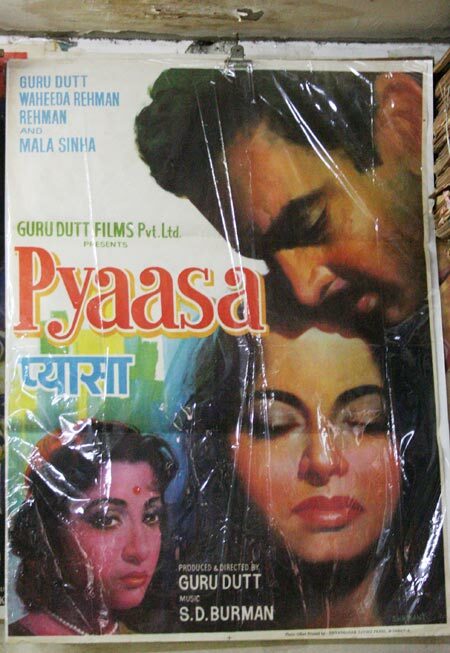 Pyaasa's poster has a different charm to it. I also like the poster of Chaudvin Ka Chand." Abu is a Madhubala fan and his favourite poster of her films is of Tarana, which was released in 1951. "I don't think there can be another Madubala ever." And then there are some personal favourites that, like a true collector, are not for sale. 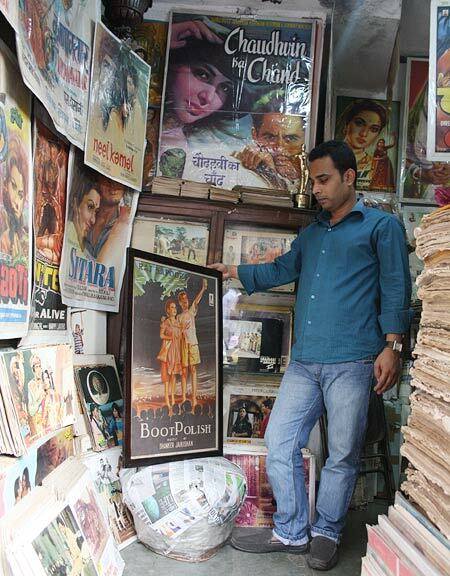 They include the poster of Sorabh Modi's film Pukar which released in 1939, and a 1950 film called Sheesh Mahal. "These posters are for my personal collection and not for sale. They are priceless. Even if someone gives me a blank cheque I would not sell them," he says. Abu's shop is so famous that recently Ranbir Kapoor's Wake Up Sid was shot here. "Ranbir had come to my shop. Although he didn't buy anything, he was quite impressed with my collection." Celebrities might not frequent his shop but a lot of them have bought posters from him. "Actors don't approach me directly. Their assistants come to the shop. Rajesh Khanna bought Aradhna's poster while Dev Anand had called for Kinare Kinare. Dharmendra bought the brochure of Satyakam." Abu agrees that a lot of fake posters are available in the market. "It's difficult to differentiate between the real and fake. Generally we check for the name of the printer or the painter at the bottom of the poster." 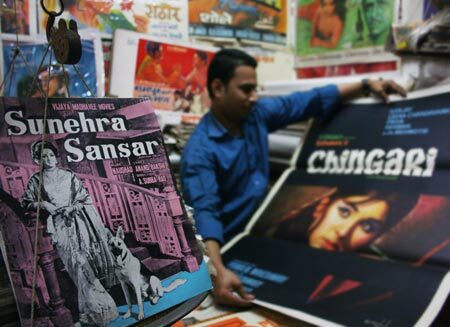 He also feels that, with posters going digital, the art of poster making is dying out. "In the old days, posters were larger than life. They had a certain elegance. With computers taking over from painters, today's posters have lost their charm." Of modern day films, the ones whose posters are most in demand are Dilwale Dulhaniya Le Jayenge, Andaz Apna Apna and Kabhi Khushi Kabhie Gham. And, of course, "Shah Rukh Khan is everyone's favourite, so posters like DDLJ, Kuch Kuch Hota Hai and My Name Is Khan are easily sold." Recently, his collection was showcased at the International Indian Film Academy Awards held in Canada. The exhibition included a wide selection of original hand-painted posters and billboards from local and international collections. There was a special mention of Abu along with the posters in a magazine published by IIFA called Picture House: The Art of Bollywood. Abu doesn't know about the future but currently he is very happy and satisfied with his work, "I don't know if anyone will continue with this, but currently, I am glad that I am able to turn my passion into my business," he says.